While the San Francisco Playhouse audience was delving into Lucas Hnath’s The Christians, a powerful, fraught examination of faith and organized religion, protestors were shutting down airports in demonstrations against the Trump administration’s ban on immigrants from countries whose religions posed a perceived threat to our nation. In other words, the spiritual and emotional chaos inside and outside the theater were well matched. Questions of faith – why we believe what we believe, why we want or need to believe what we believe, how we choose to live in our faith – will never be answered because each human being contains a multitude of answers at any given moment. Faith is powerful, elusive and subject to influence by ego, fear, instability, anger, desperation, peer pressure, greed and joy. In only 90 concentrated minutes, Hnath (one of the country’s hottest playwrights) manages to touch on all of that and provoke some hefty, complicated and unresolvable responses. The fact that church is already so much like theater is exploited in the set-up for Hnath’s play. 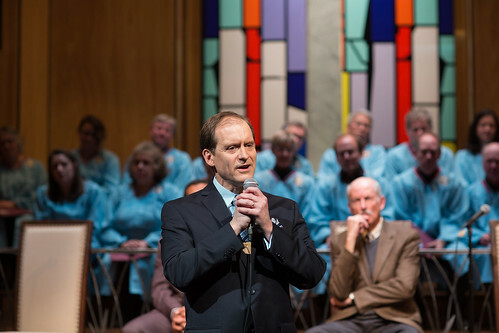 For the SF Playhouse production that opened on Saturday, Jan. 28, director and set designer Bill English turns the theater into a sleek contemporary mega-church somewhere in America in the 21st century. It’s the kind of church, we’re told, that has a cafe and a bookshop in the lobby and a parking lot so big you’ll get lost if you’re not careful. Almost as prominent as the abstract stained-glass windows are the video monitors hovering above the choir (played here by members of the First Unitarian Universalist Society of San Francisco). The setting feels so real that when Pastor Paul asks us to bow our heads in prayer, I looked around the audience half expecting audience member/congregants to do his bidding. As you might expect in a church of this size, the speakers use microphones, a detail that will come to complicate the play as it takes on more dimension. But at its start, The Christians is simply a re-creation of a Sunday church service. Pastor Paul (the always authentic and compelling Anthony Fusco invites us to a day of celebration: all debts incurred by the church in the building of its massive new home have been paid. He also drops a bombshell revelation: God has revealed to him that there is no such thing as hell – if anything, we are in hell now and striving, through Christ, to evolve heavenward. Such a profound change in belief does not sit well with Assistant Pastor Joshua (Lance Gardner), who immediately engages Pastor Paul in a scripture-laden debate. From here, the straightforward sermon-as-play deviates, and Paul becomes our guide through the fallout form his revelation. Interestingly, Hnath never allows the play to change settings: all the ensuing scenes take place in the pulpit and with the characters holding the microphones as if they were still in front of the congregation. At times, as when Pastor Paul is in discussion with Elder Jay (Warren David Keith), a member of the church’s board of directors, or with his wife, Elizabeth (Stephanie Prentice), they are speaking face to face with microphones in hand as if performing a duet minus the music. It’s a bizarre visual and is somewhat detrimental to the emotional impact of the scenes, but the notion of these discussions and debates playing out in an amplified and public way has an unnerving effect. And then there are the tangles and and dangers of those microphone chords getting in the way – communication is never easy here. If God can reveal to Paul that there is no hell, he can just as easily reveal to Joshua that there is. When a single mother congregant (Millie Brooks) express her conflicted feelings about both ways of thinking, Paul fails to provide compelling answers, and his church spirals into full schism. Hnath doesn’t go for clear heroes and villains here, and the public beliefs are allowed to show their personal roots. There’s nothing public here that isn’t also bound to deeply held beliefs from childhood or woven into our most intimate family relationships. Faith is such a complex thing. It can elevate and buffer us from the challenges of life. It can even promise eternal life with other believers, all the while dividing and alienating us in this life. How we invest our faith is among life’s most challenging issues, and in this particular moment, it seems to be dividing the nation and, indeed, the world, as it has for seemingly ever. That’s one of the reasons Pastor Paul’s revelation is so divisive. It’s so simple and, in may ways, removes the intricate structure of organized religion from the heaven-hell-sinner-saint equation. “We create an insurmountable distance,” he says, “where there is no distance at all.” Amen. 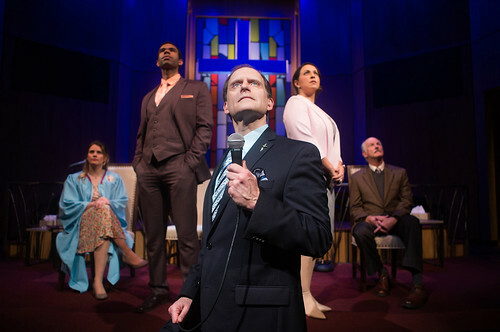 Lucas Hnath’s The Christians continues through March 11 at San Francisco Playhouse, 450 Post St., San Francisco. Tickets are $20-$125. Call 415-677-9596 or visit www.sfplayhouse.org. Chad, thanks for this eloquent meditation on how the play impacted you. Thank you for your nice comments about this play, that we all love so much. I’m happy it seems to be having the effect we hoped it could. Chad, I have seen this play twice, at the Humana, where it was born, and at the Mark Taper, and is one of my all time favorite plays. My eager expectation for SF Playhouse’s production was high and I was not disappointed. It has emotional wallop, depth and great pathos. It is beautifully performed and thoughtfully and masterfully directed. The continuous utilizing of the microphones is a stagecraft device that is part of the playwrights intention, and dealing with them as one crosses the pulpit during services was supposed to add a bit of distracting realism. During the other scenes the microphones literally magnifies the messages. The Christians is a rarity regarding plays about religion, it is respectful of differing beliefs, an especially important message today.